Since ole Mikey Schenker sobered up and realised that he still have a career in music, the old gunslinger has shown a very creative side of himself. After his years under the McAuley-Schenker moniker, he did release a lot of music and toured, but in all honesty, most of his records were unfocused and even schizophrenic and much too often of poor quality. Sure, he did try to reform with UFO for some years and records, but the result and interest from fans was underwhelming and his solo stuff didn’t make anyone happy. For a guy who has released classic rock music with bands such as Scorpions and UFO – and not to mention his work with his own band MSG – the Michael Schenker Group, many years of late has looked like a complete waste and the guitarist – often in a haze of drugs and alcohol – has made some really bad decisions, decisions that with some bad luck, could have ended his career totally. For me, it took a while to get into – and appreciate – Schenker’s music, as a guitarist he was always convincing but it wasn’t until he teamed up with former Grand Prix lead singer Robin McAuley I took some interest in the guy. The year was 1987 and yours truly was more or less obsessed with melodic rock and AOR – keyboards, catchy melodies and big choruses were a must for me in those days and I hardly listened to anything else. All of those things were included on MSG’s – now retitled McAuley Schenker Group – debut album Perfect Timing and I loved that album hard. Two more albums – Save Yourself (1989) and MSG (1992) – were released before that line-up fell apart and except for the Leif Sundin (ex – Great King Rat) fronted Written In The Sand (1996), nothing decent came out of Schenker for years and years. Fast forward to 2011 and I am being persuaded to check out Schenker’s new project Temple Of Rock and their self titled debut album. Suspicious if this really could be any good, I listened to the record and it floored me completely. Back were the melodies and groove and Schenker’s playing was as great as ever and the album was full of killer songs. With him, Michael had brought in singer Michael Voss (Mad Max), ex-UFO bass player Pete Way and ex-Scorpions drummer Herman Rarebell and it really felt like Michael Schenker was back for real. For the follow-up Bridge The Gap (2013) Voss was gone and replaced by Doogie White (Rainbow, Yngwie Malmsteen, Tank) and Way had been replaced by another former Scorpions member, Francis Buchholz. I love Doogie White’s voice and he’s a great frontman, so I was really looking forward to this. Unfortunately, the album left a whole lot to wish for. Not that the playing or chemistry was lacking, no, it was more the fact that the songs just weren’t good enough. The album wasn’t bad, but I had hoped for lots more. All this meant that my expectations for this album wasn’t either high or low. 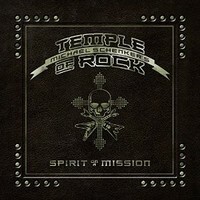 I was more curious to see if the first Temple Of Rock album was a fluke or if the follow-up might have been rushed. Being a relatively “new” fan of Schenker / MSG (new meaning that I discovered them when I had was in my early twenties), I was really hoping that Michael and the guys had come up with a real killer. I breathed a sigh after opener “Live And Let Live” was done. At least the opener is a killer. It’s a fast but catchy rocker with the classic MSG vibe. “Communion” knocked me for six with a killer refrain and the whole thing has a groove that borrows from Deep Purple. There’s nothing wrong to borrow from Deep Purple. Ever. So far, so good then. “Vigilante Man” is the first video released from this album and rightfully so. The song goes back to the MSG basics which means it rocks but it still has one helluva melody. Think Assault Attack (1982) and you get the idea. “Rock This City” falters some, it’s a decent track with a good melody but both title, lyrics and arrangements feels a bit too cliché. “Saviour Machine” has a darker touch and goes in a heavier direction and this is just what this album needs. One of the best tracks so far. If you like the faster stuff from the Joe Lynn Turner fronted Rainbow, you’ll love “Something Of The Night”. I love the Joe Lynn Turner fronted Rainbow’s fast tracks. Nuff said. “All Our Yesterdays” had all potential to become this album’s true winner. The song has some Middle East, “Gates Of Babylon”-ish influences and the verses are brilliant, but unfortunately the chorus falls flat and doesn’t lift the song the way I had hoped for. It’s still a good song, but it could have been fantastic. “Bulletproof” is a killer though. It’s a great rocker with some neo-classical influences that reminds me of mid 80’s Yngwie Malmsteen. I wish Yngwie could still write songs as good as this. Michael can obviously do what Yngwie isn’t capable of anymore. “Good Times” takes us back to the McAuley days and since I’m a big fan of that era, I love this track. It’s a magnificent pop-rocker and I can hear Robin McAuley sing this any day – next single? The album’s closer is called “Wicked” and is one of the best songs here. It’s really catchy, but not in a radio friendly pop way, but more in the vein that MSG were catchy in the early 80’s. This album is a big step up from its predecessor and the whole thing feels more focused and the songs have more structure. On the last album, many songs sounded unfinished and had a demo vibe. But the production could be better. It lacks attack and has a laid back feel all over it. I’d like the guitars more in your face and bigger and fatter drums. It is also a bit messy at times and it sometimes feels like all the instruments are lumped together in a batter of sound. Had the instruments been more separated, it would have improved the dynamics and the feel would have been more airy. Still, these are minor setbacks and doesn’t really affect the whole experience as such, as this is classic hard rock that rocks with the best of them. The Schenk has taken a big step forward with this and I have no doubt that he’s working his way back to the top. Doogie White is a brilliant singer and Michael still has his skills as a guitarist and the rhythm section is faultless. But, I really don’t get why he has dropped the MSG moniker. Temple Of Rock? Great album title and as a band name, sure why not, but MSG is so well-known I can see no reason for him not to use it. That said, if you’re a Michael Schenker fan, I see no reason why you shouldn’t own this album. Dating all the way back to the late 70s, I always thought I should get me some Michael Schenker and I continue to think so today, but it is a little overwhelming now to know where to start. I thought about starting with the Schenker-Pattison Summit stuff because I am a big Davey Pattison fan from Gamma and Robin Trower albums, but I’ve put that off because I was afraid it might be a little too “tossed off” with covers and such. From reading your reviews regularly, I think our tastes align pretty well, although I may lean just a little farther toward the raunchier side of hard rock vice the more melodic, but that is very relative and subjective at the margins as I like both. I’d start with the first MSG records and just keep going. My favourites are Assault Attack and Perfect Timing, but they are in a more melodic rock vein, I guess.